These newest snapshots reveal an even more diverse landscape than scientists imagined before New Horizons swept past Pluto in July. CAPE CANAVERAL, Fla. (AP) — The spigot has opened again, and Pluto pictures are pouring in once more from NASA’s New Horizons spacecraft. These newest snapshots reveal an even more diverse landscape than scientists imagined before New Horizons swept past Pluto in July, becoming the first spacecraft to ever visit the distant dwarf planet. “If an artist had painted this Pluto before our flyby, I probably would have called it over the top — but that’s what is actually there,” said Alan Stern, New Horizons’ principal scientist from Southwest Research Institute in Boulder, Colorado. One outer solar-system geologist, William McKinnon of Washington University in St. Louis, said if the ridges are, in fact, dunes, that would be “completely wild” given Pluto’s thin atmosphere. “Either Pluto had a thicker atmosphere in the past, or some process we haven’t figured out is at work. It’s a head-scratcher,” McKinnon said in a written statement. The jumble of mountains, on the other hand, may be huge blocks of ice floating in a softer, vast deposit of frozen nitrogen. After several weeks of collecting engineering data from New Horizons, scientists started getting fresh Pluto pictures last weekend. The latest images were released Thursday. 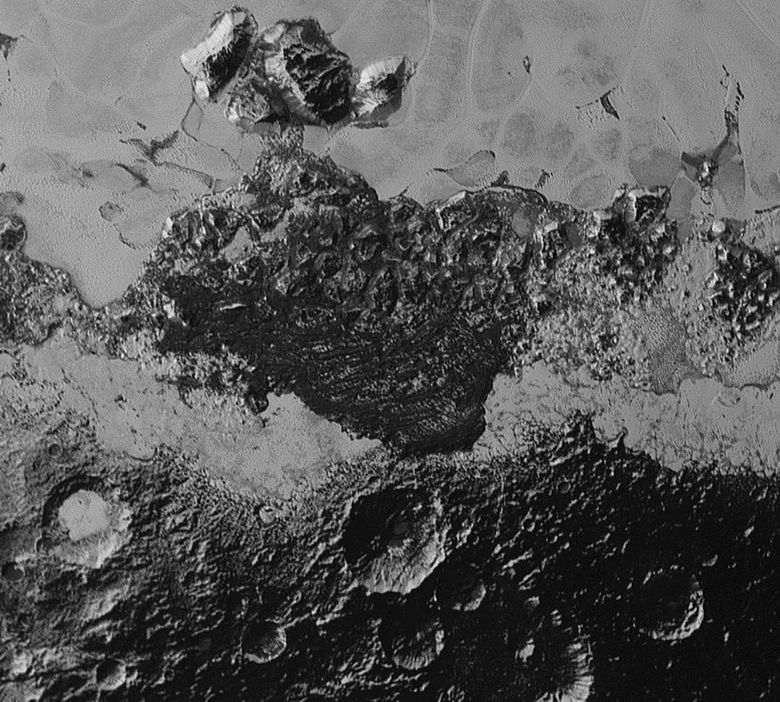 Besides geologic features, the images show that the atmospheric haze surrounding Pluto has multiple layers. What’s more, the haze crates a twilight effect that enables New Horizons to study places on the night side that scientists never expected to see. Monday marks two months from New Horizons’ close encounter with Pluto on July 14, following a journey from Cape Canaveral, Florida, spanning 3 billion miles and 9½ years. 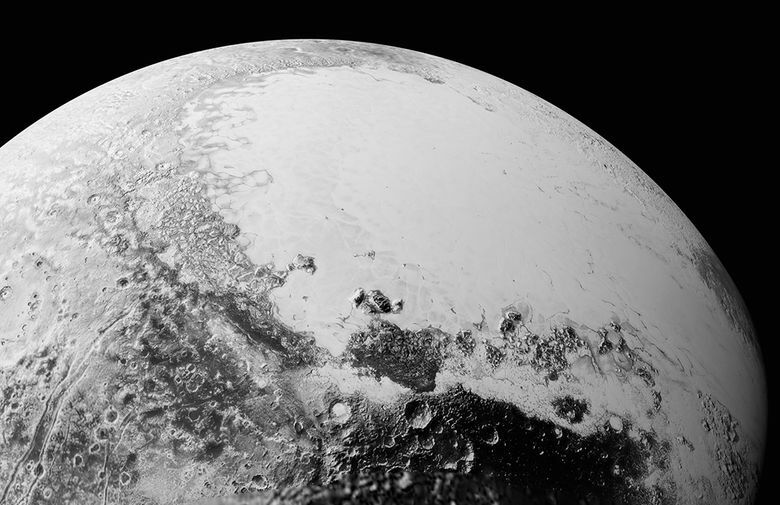 As of Friday, the spacecraft was 44 million miles past Pluto. So much data were collected during the Pluto flyby that it will take until next fall to retrieve it all here on Earth. The spacecraft is operated from the Johns Hopkins University Applied Physics Laboratory in Laurel, Maryland, which also designed and built it. New Horizons’ next target, pending formal approval by NASA, will be a much smaller object that orbits 1 billion miles beyond Pluto. It, too, lies in the so-called Kuiper Belt, a frigid twilight zone on the outskirts of our solar system. Following a set of maneuvers, New Horizons would reach PT1 — short for Potential Target 1 — in 2019.